Okay-so you’ve got the venue locked up and it’s time to select your entertainment but now you don’t know if you want a Band or DJ. What should you do? It’s a very common question that we get a lot. 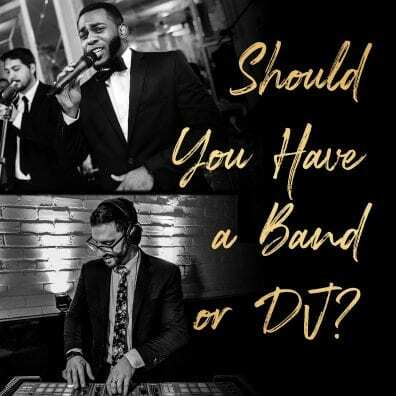 And though there might not be a definitive answer, we can comfortably say there is an abundance of talent in both the wedding band and DJ categories today. We’ll cover all the important things to consider as well as tips and tricks to look for and use when shopping for wedding entertainment. Very often, couples make a decision based on budget. Most professional wedding bands in the Tri-State area range anywhere between $6,000 to as much as $25,000. For DJs the range typically starts at $1,500 but can go north to $5,000 in some places. Budget is SUPER important. But remember this, according to our friends over at TheKnot: within one week after their reception, 78% of couples say they would have made the entertainment their highest priority. TIP: View your entertainment budget as an investment into making sure you have a great party rather than as an expense. What to consider: Experience. You want someone who has it. Anyone can press play on a song, but it is crucial to hire someone who has been in this industry and has the know-how to run a seamless and fun party. TIP: Ask what their planning process is like. You’ll want someone who listens and has a thorough and detailed process. For the great Event Hosts/DJs, the music is the easiest part. It’s the other things that count. For instance, on the day of you’ll want their experience to properly work closely with your matire’d, banquet coordinator, venue staff, photographers, wedding planners, and other vendors throughout the night. Another word that is important – timeline. Tip: The timeline is what makes or breaks your wedding, so get an Event Host who knows how to run one. Go check out our other blog on timelines to see why. – How large is their playlist? – Are the bands set units, or do I get random players on the day of my wedding and CAN I SEE THEM LIVE PRIOR TO BOOKING? TIP: Ask if the performers you see will be the ones guaranteed at your event. Out of respect to clients, most companies won’t let you drop into a wedding to hear a band. 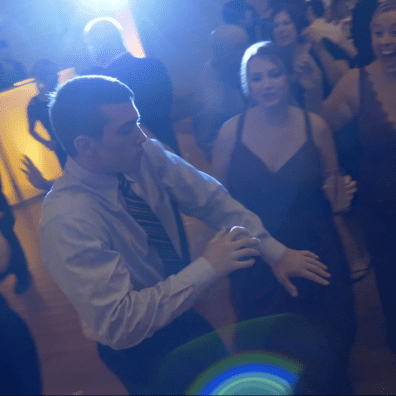 However, some companies hide behind this to utilize a bait and switch between what you see and hear in a video and what actually shows up at your wedding. If you can’t hear them live, buyer beware. These are all important questions to ask to make sure you’re getting full transparency and gaining a comfort level with the company you are considering. As you can see there are a ton of things to consider. However once you iron out all the details you can look at it simply. It’s always best to go into an investment with the best information and preparation possible. TIP: Whether you choose Band or DJ, make it immersive and fun. You’re getting married….It should be an incredible celebration for everyone to remember!